VANCOUVER, British Columbia, Oct. 1, 2018 /PRNewswire/ — Canadian freight digitization startup Freightera is honored to announce that CEO Eric Beckwitt has just won the 2019 Clean50 Award for his outstanding contribution to advance the cause of sustainability and clean capitalism in Canada over the past two years. The award was presented at the Clean50 Summit in Toronto on Sept. 27, 2018. The award winners were selected from more than 600 nominees and competed in 16 categories including Manufacturing and Transportation, where Eric Beckwitt won the award along with Mario Plourde, CEO of Cascades, and Sarah Buckle, director of enterprise risk and sustainability at Translink, the greater Vancouver transit authority. Past honorees include Premier Kathleen Wynne of Ontario, who opened the summit, Canadian Minister of Environment and Climate Change Catherine McKenna, Vancouver Mayor Gregor Robertson and Galen G. Weston of Loblaws. Clean50 is one of the most important awards for corporate contribution to environmental sustainability in Canada. This means a lot to everyone at Freightera, an online marketplace that brings together businesses that need to ship freight and transport companies that move it. Freightera’s mission is to make freight easy, accessible and green. Global freight shipping, at just under $10 trillion a year, is among the largest markets on earth. It is also one of the most wasteful, inefficient and polluting industries. Freightera is automating and transforming this global market, increasing efficiency and profitability, and sharply cutting shipping costs and emissions from freight. It is Freightera’s company mission and also Eric’s personal mission. Eric Beckwitt was born in California but had to flee with the family in 2003 to save his son, who suffered severe asthma in the Sierra Nevada foothills where the Beckwitt family lived. Since then they’ve been living in Vancouver, Canada, one of the world’s greenest cities. Their son has been completely healthy. According to the Center for Disease Control and Prevention, 8.3 percent of the children in the U.S. have asthma. It is one of the leading causes of emergency room visits and causes the premature death of 4,000 people per year in the U.S. alone. In 2016, the science publication Nature noted that air pollution from ocean freight shipping, specifically nitrous oxides, sulfur oxides and particulate matter, was causing the premature deaths of 60,000 people worldwide. Concentrated in the ports, these deaths are coming mostly from cancer and cardiovascular illness. Independently, researchers with the European parliament modeled that under business as usual, emissions from ocean and air freight, currently outside the UN Climate Change emissions reduction negotiations, would grow so fast that by 2050 they would be 20-50 percent of global emissions. Eric Beckwitt and his wife, Freightera co-founder Zhenya Beck, did not go green over their son’s life-threatening condition. It was their passion and profession long before that. Eric was involved in conservation in the Sierra Nevada since an early age. Zhenya worked as an environmental journalist in Siberia’s Lake Baikal region in the 1990s. Freightera focused on filling empty trucks. Thirty percent of the freight trucks on the road are empty and 80 percent are booked only one way. The first success came after Freightera covered North America with the first billion less than truckload (LTL) lanes. Now businesses shipping freight in small towns and remote locations could find the best-priced transport companies with trucks already scheduled to be in their locality when they needed them to take the freight consolidated with others across the country. Freightera brought online many companies that were not previously available to freight shippers and helped many smaller transportation companies build complete digital rates and service areas for the first time. The other answer was in shifting freight to the lowest emission transportation mode. In the vast Canadian landscape, switching from trucks to rail makes a ton of sense. Rail produces 60 percent less emissions. With good advanced planning, it’s also a more beneficial, less expensive way for businesses to ship goods. In 2016, Freightera was invited to write the thought leadership article A Green Future for Freight for the G7 Summit edition of Climate Change – The New Economy. That work led to Freightera’s invitation to present options for greening freight at the COP22 UN Climate Conference in Marrakesh and collaboration with SmartWay Canada to promote more efficient, lower emission carriers. Ironically high energy efficiency leads to lower cost and lower emissions and it is exactly what carriers and society need. Eric Beckwitt has also been researching, finding and promoting other climate-friendly solutions. Freightera has signed all Class 1 rail carriers in Canada and the U.S. and brought online rail rates from CN Rail, one of the long-term supporters of Clean50 Awards and their sustainability mission. Over 80 percent of Freightera bookings are now SmartWay or rail. In recent months, up to 22 percent of lower emission bookings were via CN and CP rail partner carriers alone, with Union Pacific coming online shortly. Freightera found that shippers will change to lower emission options immediately if these options are lower cost. They believe this fact will encourage transport companies to invest in new lower fuel consumption or zero emission vehicles that are lower cost to operate, more efficient and allow them to offer lower-cost services and grow market share. It also encourages more firms to use rail for long-haul freight and not drive partially filled trucks across the continent. Freightera is creating a unified global marketplace for freight shipping. Starting in North America, Freightera is automating freight transportation and increasing operating margins for carriers and businesses shipping freight. Freightera creates partnerships and systems and promotes new technologies that allow businesses to find the best price and lowest emission transportation options. Over 8,000 manufacturers, distributors, wholesalers and retailers in the U.S. and Canada use Freightera for 24/7 online access to billions of all-inclusive freight rates and instant freight booking. For more information, see freightera.com. 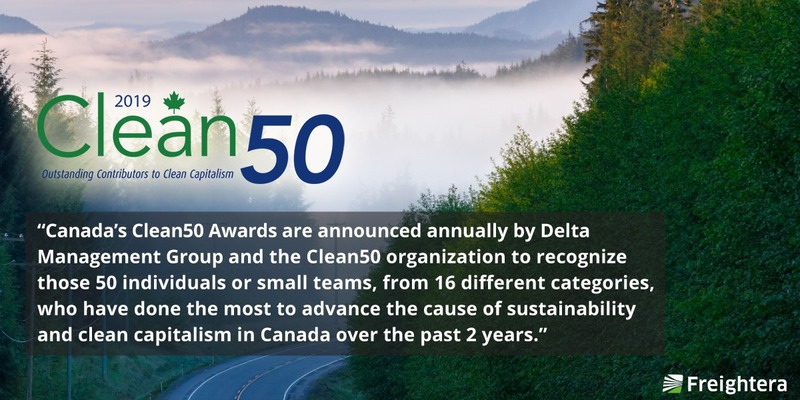 Canada’s Clean50 award program and summit were founded in 2011 by Delta Management Group, Canada’s leading clean tech and sustainability executive search firm, and their CEO Gavin Pitchford. It was established in response to a trend the firm noted when performing executive searches on behalf of clients: While there was growing acknowledgment that climate change was real and that broad solutions were needed, most were working within industry silos and not sharing information with anyone. 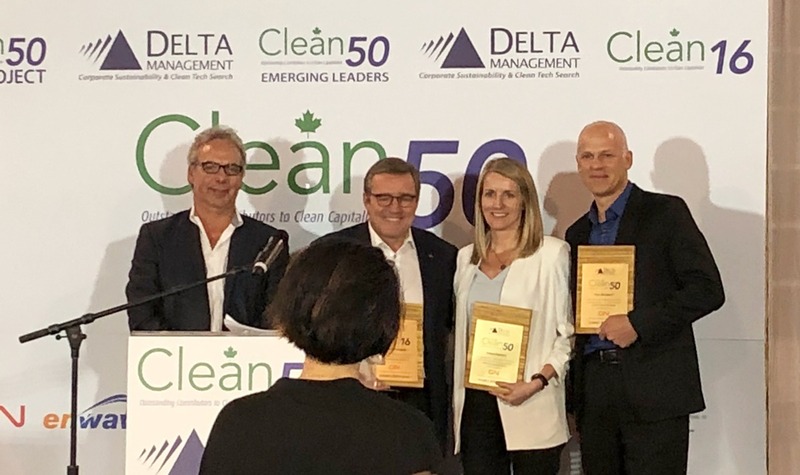 Having identified the issue, Delta created the Clean50 award to identify leaders from every sector and then hosted the summit to bring those leaders together. Ninety-eight percent of honourees attend each year and numerous past winners come back to continue to play a role in deliberations, learn new things and get inspired one more time. Including small teams and Emerging Leaders, The Clean50 now numbers over 500 of Canada’s climate change-fighting rock stars and the summit has led to numerous cross-sector and within-sector collaborations. In addition, the honourees’ stories have inspired hundreds of Canadians to do more and, in many instances, simply copy what the honourees had already proven could be done.